Depression is defined as a cluster of specific symptoms with associated impairment affecting 7.4% of the adolescents globally. As part of the systematic review, around 1000 relevant articles published between January 1978 and December 2017 were identified by systematic online search from 6 electronic databases (PubMed, PsycInfo, Science Direct, MEDLINE, Scopus, and Google Scholar) and overall, 56 relevant studies were included in the current review as per the inclusion criteria. Findings highlight the potential importance of the relationship between healthy dietary patterns or quality and positive mental health throughout life span. Various nutrition and dietary compounds have been suggested to be involved in the onset maintenance and severity of depressive symptoms and disorders. Nutritional compounds might modulate depression associated biomarkers. In this context, several healthy foods such as olive oil, fish, nuts, legumes, dairy products, fruits, and vegetables have been inversely associated with the risk of depression and might also improve symptoms. In contrast western dietary patterns including the consumption of sweetened beverages, fried foods, processed meats, baked products have been shown to be associated with an increased risk of depression in longitudinal studies. Diet and nutrition offer key modifiable targets for the prevention of mental disorders. Evidence is steadily growing for the relation between nutrition deficiencies, diet quality and mental health and for the efficacy and use of nutritional supplements to address deficiencies or as augmentation therapies. We advocate recognition of diet and nutrition as crucial factors in prevention and management of mental disorders. Depression is defined as a cluster of specific symptoms with associated impairment affecting 7.4% of the adolescents (10–14 years) globally. The clinical and diagnostic features of the disorder are broadly similar in adolescents and adults., Research suggests that depression in adolescent is an early on-set sub form of the equivalent adult disorder; it has strong linkage with the recurrence later in life. The illness in adolescents and adults has similar clinical features and patterns of neural activity. Due to the associated symptoms such as mood reactivity and irritability, depression in adolescents is more often missed than in adults. Also, due to primary presenting problems like anxiety, eating disorders, refusal to attend school, decline in academic performance, unexplained physical symptoms or behavioral problems, it remains unnoticed. Furthermore data from findings of recent systematic reviews and meta-analysis concludes a significant evidence of association between unhealthy eating patterns and poor mental health among children and adolescents. Also high intakes of fruit, vegetables, fish, and whole grains may be associated with a reduced depression risk in adults and adherence to a Mediterranean diet may contribute to the prevention of a series of brain diseases. Most mental disorders begin during youth but are detected for the first time in later life. Self-harm and suicide are the leading cause of death in young people. Poor mental health is associated with overall health and developmental concerns among youth; like educational achievements, reproductive and sexual health, substance abuse and violence. Even in wealthier societies, the needs of mental health care services are unmet, with worse situations in developing countries. Therefore, there is a need to understand the patterns of onset of psychiatric disorders during childhood and adolescence, transitioning into adulthood. Thus it is also important to prevent, recognize and treat this disorder. The current systematic review represents an updated comprehensive data about depression in adolescents, its mechanism and the role of nutrition in prevention and treatment. 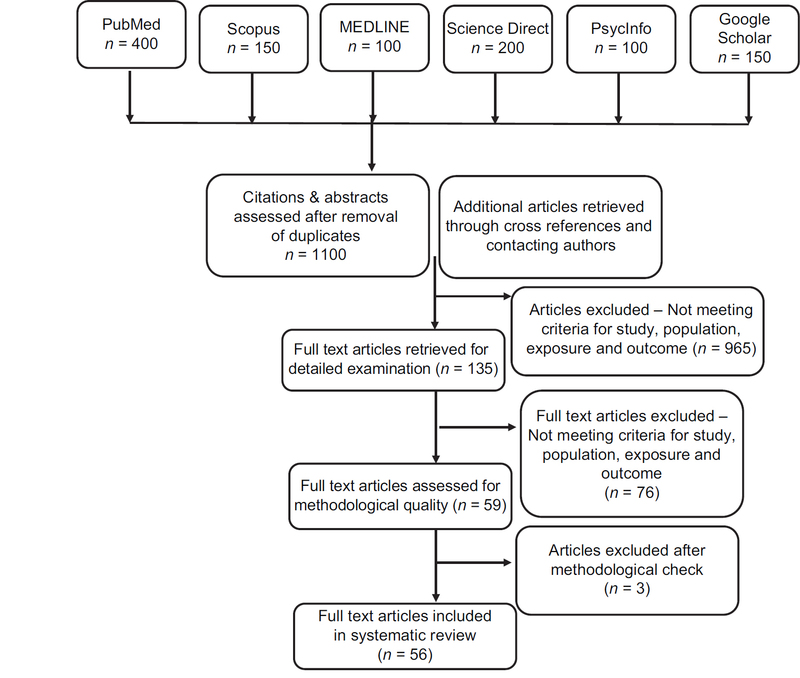 Relevant articles were identified by systematic online search from 6 electronic databases, i.e., PubMed, PsycInfo, Science Direct, MEDLINE, Scopus, and Google Scholar. The articles and research studies published between January 1978 and December 2017 were selected. Relevant keywords relating to depression, in combination with (and/or) mechanisms, psychosocial risk factors, nutritional medicine, food, nutrition, malnutrition, mental health, adolescents and/or clinical trials, interventions, randomized control trials, longitudinal studies, cross-sectional studies were used to extract articles. Additional publications were identified from references cited in the original articles. We screened potentially relevant articles for eligibility based on titles and abstracts. If they met the eligibility criteria, the full text publication was retrieved and reviewed. The reference lists of relevant articles were also screened to include additional studies. Full text articles were retrieved if the citation was considered eligible and was subjected to a second evaluation. Data were extracted from selected studies and details are presented below. A flowchart detailing the study selection process is shown in [Figure 1]. The initial search yielded 1100 citations of which 965 were excluded upon initial screening for not meeting inclusion criteria. Of the remaining 135, 43 were excluded for the following reasons: not a target population, did not include a target outcome, not a relevant intervention, not a target study design, insufficient detail of dietary intervention and not a validated measure of mental health outcomes. 50 studies fulfilled the inclusion criteria and additional 6 studies were screened through the reference list and citations. Overall, 56 studies were included in the review. The nutritional factors which play an important role in the etiology of depression are discussed below. A robust research evidence suggests that diet is to mental health, across the lifespan, although there are particular periods of rapid development. Prenatal and postnatal diet is important to the mental health of the mother but also has implications for mental development and cognition of her offspring., This suggests the potential to target the nutritional status of a woman during pregnancy in order to positively influence future mental health outcomes in children and adolescents. As in other domains of health, childhood experiences have an impact on the future health of the adolescent. Unfortunately, many studies have reported that young people are eating well below dietary recommendations. They are increasingly reliant on nutrient poor, foods high in sugar and saturated fatty acids such as soft drinks, confectionary items, and baked snacks. These dietary patterns are not only significantly related to obesity and non-communicable diseases, but they also critically impact the brain development and mental health as well. Consumption of diet and snack like foods has been linked to behavioral and emotional problems in children, which has been linked to mental disorders in adulthood. During adolescence, teenagers have greater independence to food choices and begin to establish dietary habits that will carry through adulthood. This period is also critical, as it is typically during this phase that mental disorders emerge for the first time. Globally, researchers have consistently demonstrated that diet quality is important to mental health of young people transitioning into adulthood.,, Existing systematic reviews confirm a relationship between diet quality and mental health in children and adolescence. This research evidence suggests the importance of establishing snack like foods with nutrient rich diets that support brain development and lays the foundation for a healthy adulthood. Depression is perceived as a biochemical based mental health disorder, while nutrition can impact its onset, severity and duration. Noticeable food patterns (like poor appetite, skipping meals, and a dominant desire for sweet foods) which precede depression are the same as those occurring during depression. Research suggests that dietary patterns in Asian and American countries are often deficient in nutrients, especially vitamins, minerals, and omega-3 fatty acids. Also, a similar pattern of dietary intake is observed (diets deficient in vitamins, minerals, and omega-3 fatty acids) among patients with mental disorders. Studies have indicated that daily supplementation of these vital nutrients is often effective in reducing the symptoms of the patients. Amino acids supplements have also been found to reduce symptoms, as they are converted to neurotransmitters which in turn alleviate depression and other mental health disorders. On the basis of accumulating research evidence, diet therapy or modifications in the diet may be appropriate in controlling and preventing depression, anxiety, eating disorders, schizophrenia, and addictions. With special relevance to depression, various significant nutrients are discussed below. Proteins (amino acids) are the building blocks of life. Our body manufactures 12 amino acids and the remaining 8 have to be supplied by the diet (essential amino acids). High biological value protein foods like meats, eggs, milk and dairy products are rich in good quality protein and provide essential amino acids. Plant-based proteins such as peas, beans, and grains are low biological value protein and may lack one or two essential amino acids. Dietary intake of protein (intake of individual amino acids) can affect the brain functioning and mental health. Furthermore, many of the neurotransmitters in the brain are made from amino acids. For example, the amino acids tryptophan and tyrosine are precursors of neurotransmitters serotonin and dopamine. Low dietary intake of these amino acids results in reduced synthesis of the respective neurotransmitters, which is associated with low mood and aggression in patients. Dopamine, noradrenaline and adrenaline, primarily influences motivation. 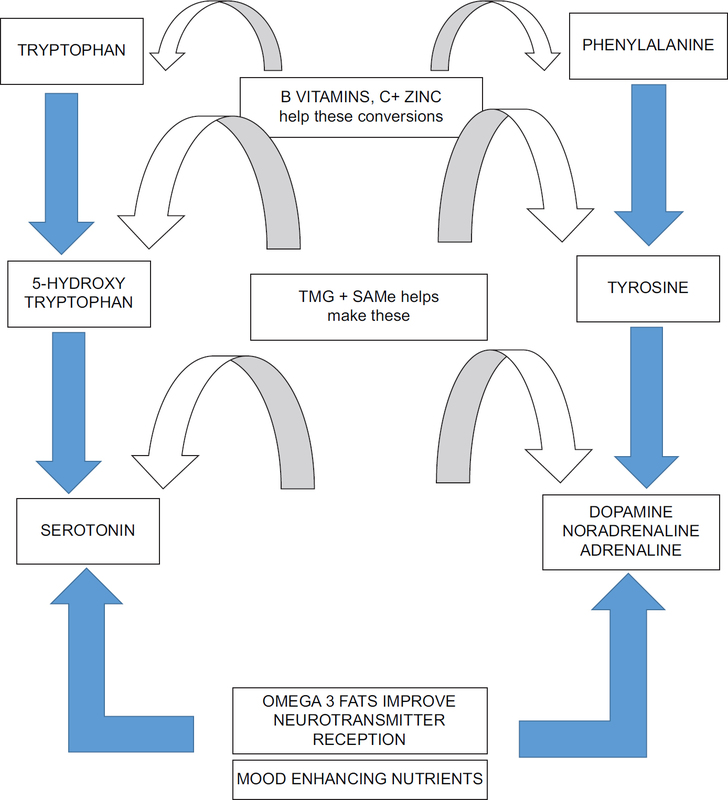 [Figure 2] shows those nutrients that are essential for the production of serotonin, dopamine, adrenaline, and noradrenaline. If a person is suffering from low mood, feels tense and irritable, is tired all the time, tends to comfort eat, has sleeping problems, the chances are they are short on serotonin. [Table 1] summaries the effect of deficiency of the neurotransmitters, the foods that will make the deficiency worse and those that will improve the symptoms. Serotonin is made from the amino acid tryptophan, a constituent of protein. Dr Philip Cowen and colleagues from the University of Oxford, UK, conducted a trail on 15 volunteers who had history of depression, but were currently not depressed. They gave these volunteers a nutritionally balanced drink, that excluded tryptophan. Within seven hours from the consumption of the drink, 10 out of 15 participants noticed a worsening of their mood and started to show signs of depression. On being given the same drink, but this time with added tryptophan, their mood improved. The recommended dosage of this amino acid is 100 mg of 5 Hydroxy Tryptophan (5-HTP), two or three times a day, for depression. Some supplements also provide vitamins and minerals such as B12 and folic acid, which may be even more effective because these nutrients help to turn 5-HTP into serotonin. Another group of neurotransmitters associated with lack of motivation and depression are catecholamines—dopamine, noradrenaline and adrenaline. As discussed in [Figure 2], both adrenaline and noradrenaline are synthesized from dopamine, which is made from the amino acid phenylalanine. A group of researchers from Chicago, screened depressed patients by testing phenylethylamine in the blood; low levels meant, more amounts of phenylethylamine. They supplemented 40 depressed patients with supplements of phenylalanine and 31 of them showed improved symptoms. Tyrosine also has been shown to work well in those with dopamine-dependent depression. A pilot study conducted on 12 patients in France concluded that administration of 3200 mg of tyrosine a day showed significant improvement in mood and sleep on the very first day. Research suggests that best results are achieved by supplementing all these amino acids - 5-HTP, phenylalanine and tyrosine - together with the B group vitamins (B6, B12) and folic acid which help turn them into neurotransmitters. SAMe and TMG stand for s-adenosyl methionine and tri-methyl-glycine, respectively. These two strange sounding nutrients are kind of amino acids. They are methyl group donors and can lower homocysteine levels by donating methyl groups. Brain has the highest levels of lipids. These brain lipids (composed of fatty acids) are structural constituents of membranes. Gray matter in the brain contains 50% polyunsaturated fatty acids (33% are omega-3) and are supplied through diet. N-3 PUFAs modulate the mechanism of brain neuron communication. Decosahexanoic Acid (DHA) predominantly constitutes 15% of the brain, whereas EPA constitutes 0.2%. Therefore, DHA concentration affects the membrane permeability of cells in Central Nervous System (CNS) and deficiency of DHA is linked with the dysfunction and impaired transmission neurotransmitters; serotonin, norepinephrine, and dopamine. Phospholipids of neural cell membrane are composed of PUFAs. N-3 PUFAs and fish consumption have been connected to the inflammation theory. Research suggests that depletion of n-3 PUFAs can be an etiological factor in several neuropsychiatric disorders including depression. Lower intake or concentrations of n-3 PUFAs is observed in depressed individuals. Fish intake of >150 g/week is linked to decreased levels of proinflammatory markers like C Reactive Protein (CRP) and cytokines such as interleukin-6. This supports the hypothesis that eating more fish could lead to reduced depressive symptoms through modification of inflammatory process. Another researcher from London's Hammersmith Hospital, UK reported a case study of a 21-year-old student who had been on a variety of antidepressants, but had shown no improvement. He had a very low sense of esteem, little appetite, sleeping problems, found it hard to socialize and often thought of killing himself. After 1 month of supplementation with ethyle-EPA (eicosapentaenoic acid), a concentrated form of omega-3, he was no longer having suicidal thoughts and after 9 months of supplementation, no longer had depression. Decreased levels of brain derived neurotrophic factor. Supplementation trails with omega 3 PUFAs have shown positive effects in depression. In a double blind trial, 20 subjects with major depressive disorders received (randomly) 3.3 g/day of EPA + DHA (fish oil) or placebo for 8 weeks in addition to the usual treatment. Patients who received PUFA (EPA + DHA) supplementation had lower scores on the depression scale. Noaghuil and Hibbeln investigated cross-national prevalence rates of bipolar disorders and concluded that there is a strong relationship between increased sea food consumption and lower prevalence rates. Regular consumption of fish has also been associated with reduced suicidal ideation and better self-reported status of mental health. B group vitamins act as co-factors in key enzymes that control the production and balance of neurotransmitters. For example, serotonin (5-HT) is produced from 5-HTP by addition of a methyl group (carboxylase) as is adrenaline from noradrenaline. This process is highly dependent on vitamin B12, B6, and folate. Folate deficiency is extremely common among depressed patients. A study conducted at Depression and Clinical Research Program at Boston Massachusetts General Hospital, USA on 213 depressed patients, reported that people with lower folate levels had more “melancholic” depression. Another research on people diagnosed with depression and schizophrenia was conducted at Kings College Hospital, London, UK. The researchers found that one in three of these patients had borderline or definite folate deficiency. These patients than took part in a supplementation trial, where they took folate for 6 months. Post 6 months supplementation trail, these patients had significantly improved recovery and the longer they took folate, better they felt. After conception of the fetus, intake of folate is important for the formation of the neural tube, development of brain and nervous system, normal growth, nucleotide synthesis as well as programmed cell death. Research suggests that deficiency of folate may affect one-third of psychiatric patients. This could be due to disturbed appetite, lowered intake, altered absorption or increased requirement. Interestingly, individuals with megaloblastic anemia have been reported to have neuropsychiatric problems, and depression is the most common neuropsychiatric manifestation of folate deficiency. However, folate deficiency and depression are interconnected, it is not clear whether depression leads to folate deficiency or primary folate deficiency is a cause of depression. Deficiency of folate can lead to irregularities in methylation and synthesis of monoamine neurotransmitters. Different forms of folate share an inter conversion potential and are present in the pathways of carbon cycles impacting the synthesis of dopamine, serotonin and norepinephrine. Folate in the form of methylenetetrahydrofolate (MTHF) is required in the methylation process of homocysteine (a sulphureted amino acid) back to methionine. Homocysteine present in meat, fish, cheese, egg and poultry is derived from dietary methionine. Elevated levels of blood homocysteine is a functional marker of folate deficiency and is linked to the prevalence of depression. In addition to this, homocysteine is suggested to have neurotoxic effects. Several other methylation reactions, like the synthesis of S-adenosyl-methionine (SAMe, the vital methyl donor) require MTHF. Anti-depressant properties of SAMe have also been suggested. Cognitive changes are observed in adolescents with borderline levels of vitamin B12 deficiency. In elderly, supplementation with cobalamin enhances cerebral and cognitive functions, delays onset of dementia and enhances language function of people with cognitive disorders. Zinc is an important mineral involved in the process of gustation (taste perception). It also protects the brain cells against the potential damage caused by free radicals. In patients with clinical depression, zinc levels are lowered. Intervention research suggest that oral zinc supplementation can influence the effectiveness of antidepressants, such as imipramine. A placebo-controlled, double blind trial of zinc supplementation in antidepressant therapy was conducted in patients who had major (unipolar) depression. Patients received zinc supplementation (6 patients; 25 mg of Zn2+ once daily) or placebo (8 patients) and were treated with standard antidepressant therapy (tricyclic antidepressants, selective serotonin reuptake inhibitors). Zinc supplementation significantly reduced scores in both measures after 6- and 12-week supplementation when compared with placebo treatment. This supplementation trail is the first demonstration of the benefit of zinc supplementation in antidepressant therapy. Iron is necessary for the synthesis of neurotransmitters and myelin, production of energy in the cerebral parenchyma and oxygenation. Iron deficiency anemia is associated depression, apathy and fatigue, affecting adolescent girls and women in the child bearing age. Fatigue, lethargy, and depression can all be symptoms of iron deficiency, which has led to studies investigating the relationship between circulating levels of iron and depression., Iron concentrations in the umbilical artery are important for the fetal development and IQ in children. Major Depressive Disorder (MDD) in adolescents is often persisting or reappearing in adult life. MDD has also been associated with inflammation and changes in iron measures, such as decreased serum transferrin levels. However, these studies are few in number, particularly for adolescents. The role of iodine in the brain development is well established. Iodine provided by the thyroid hormone regulates the energy metabolism of the cerebral cells. During pregnancy, deficiency of iodine results in Iodine Deficiency Disorders (IDD) which induces cerebral dysfunction, eventually leading to mental retardation and cretinism. Micronutrient deficiencies and malnutrition can impact the physical and mental development of a child. Given that the average age of onset for anxiety and mood disorders is 6 years and 13 years, respectively the potential for early intervention using strategies targeted at improving dietary intake at a population level may be of substantial public health benefit. Though, depression is considered as a cause of global disability among adolescents, many knowledge and research gaps still exist. Due to the immense burden of mental disorders, preventive treatment strategies and modifiable risk factors need to be identified. Furthermore, in low and middle income countries, development of cost-effective methods for detection, assessment and treatment of depression is required. In-depth research is required in reporting and understanding prevalence, causes and mechanisms underlying depression throughout lifespan. Diet and nutrition offer key modifiable targets for the prevention of mental disorders, having a fundamental role in the promotion of mental health. 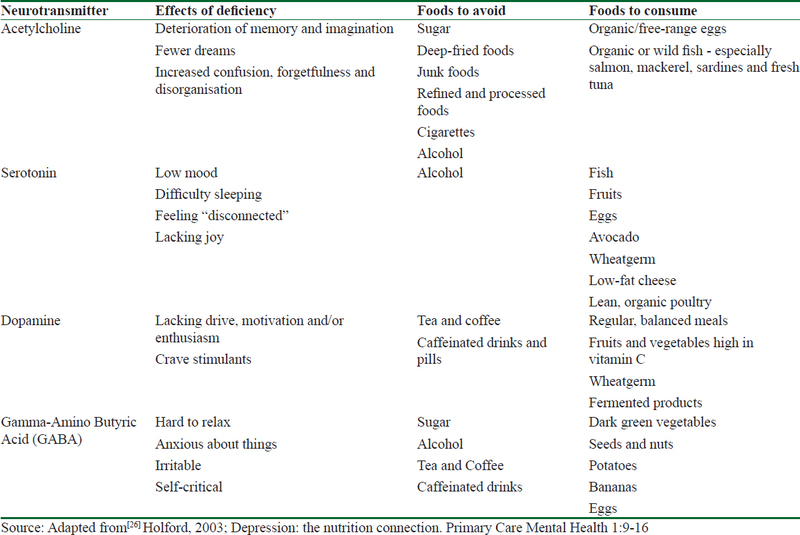 The area of nutritional neuroscience needs to be promoted for the prevention and management of depression (and other mental disorders) through a healthy diet. Further research is required in this regard because significant evidence linking diet (quality, eating pattern, and specific nutrients) and mental health among children and adolescents is now available.,,,,, Research is further required to establish the use, efficacy and dosage of nutrients (composition and constituents of a diet) in individuals with and without mental disorders. This further needs to framed into public health policies and programs. Nutritional medicine should now be considered as a mainstream element of psychiatric practice, with research, education, policy, and health promotion supporting this new framework. Authors wish to thank all the researchers and authors of the articles that were reviewed for this review. Mokdad AH, Forouzanfar MH, Daoud F, Mokdad AA, El Bcheraoui C, Moradi-Lakeh M, et al. Global burden of diseases, injuries, and risk factors for young people's health during 1990-2013: A systematic analysis for the global burden of disease study 2013. Lancet 2016;387:2383-401. Lewinsohn PM, Pettit JW, Joiner TE Jr, Seeley JR. The symptomatic expression of major depressive disorder in adolescents and young adults. J Abnorm Psychol 2013;112:244-52. Thapar A, Collishaw S, Potter R, Thapar AK. Managing and preventing depression in adolescents. BMJ 2010;340:c209. Birmaher B, Williamson DE, Dahl RE, Axelson AD, Kaufman J, Dorn DL, et al. Clinical presentation and course of depression in youth: Does onset in childhood differ from onset in adolescence? J Am Acad Child Adolesc Psychiatry 2004;43:63-70. Leaf PJ, Alegria M, Cohen P, Goodman SH, Horwitz SM, Hoven CW, et al. Mental health service use in the community and schools: Results from the four-community MECA Study. Methods for the epidemiology of child and adolescent mental disorders study. J Am Acad Child Adolesc Psychiatry 1996;35:889-97. O'Neil A, Quirk ES, Housden S, Brennan LS, Williams JL, Pasco AJ, et al. Relationship between diet and mental health in children and adolescents: A systematic review. Am J Public Health 2014;140:e31-42. Lai SJ, Hiles S, Bisquera A, Hure JA, McEvoy M, Attia J. A systematic review and meta-analysis of dietary patterns and depression in community-dwelling adults. Am J Clin Nutr 2014;99:181-97. Psaltopoulou T, Sergentanis NT, Panagiotakos BD, Sergentanis IN, Kosti R, Scarmeas N. Mediterranean diet, stroke, cognitive impairment, and depression: A meta-analysis. Ann Neurol 2013;74:580-91. Verhulst FC, Vender V. Using rating scales in a clinical context. In: Rutter M, Bishop D, Pine D, Scott S, Stevenson J, Taylor E, et al., editors. Rutter's Child and Adolescent Psychiatry. Oxford: Blackwell; 2008. p. 289-98. Jacka FN. Nutritional psychiatry: Where to next? E Bio Medicine 2017;17:24-9. Marx W, Moseley G, Berk M, Jacka FN. Nutritional psychiatry: The present state of the evidence. Proc Nutr Soc 2017;76:427-36. Baskin R, Hill B, Jacka FN, O'Neil A, Skouteris H. The association between diet quality and mental health during the perinatal period. A systematic review. Appetite 2015;91:41-7. Pina-Camacho L, Jensen SK, Gaysina D, Barker ED. Maternal depression symptoms, unhealthy diet and child emotional-behavioural dysregulation. Psychol Med 2015;45:1851-60. Barker ED, Kirkham N, Ng J, Jensen SK. Prenatal maternal depression symptoms and nutrition, and child cognitive function. Br J Psychiatry 2013;203:417-21. O'Neil A, Itsiopoulos C, Skouteris H, Opie RS, McPhie S, Hill B, et al. Preventing mental health problems in offspring by targeting dietary intake of pregnant women. BMC Med 2014;12:208. Heim C, Newport DJ, Mletzko T, Miller AH, Nemeroff CB. The link between childhood trauma and depression: Insights from HPA axis studies in humans. Psychoneuroendocrinology 2008;33:693-710. Adair LS, Popkin BM. Are child eating patterns being transformed globally? Obes Res 2005;13:1281-99. Jacka FN, Ystrom E, Brantsaeter AL, Karevold E, Roth C, Haugen M, et al. Maternal and early postnatal nutrition and mental health of offspring by age 5 years: A prospective cohort study. J Am Acad Child Adolesc Psychiatry 2013;52:1038-47. Mikkila V, Rasanen L, Raitakari OT, Pietinen P, Viikari J. Longitudinal changes in diet from childhood into adulthood with respect to risk of cardiovascular diseases: The cardiovascular risk in young Finns study. Eur J Clin Nutr 2004;58:1038-45. Jacka FN, Kremer PJ, Berk M, de Silva-Sanigorski AM, Moodie M, Leslie ER, et al. A prospective study of diet quality and mental health in adolescents. PLoS One 2011;6:e24805. Jacka FN, Kremer PJ, Leslie, ER Berk M, Patton GC, Toumbourou JW, et al. Associations between diet quality and depressed mood in adolescents: Results from the Australian Healthy Neighbourhoods Study. Aust N Z J Psychiatry 2010;44:435-42. Oellingrath IM, Svendsen MV, Hestetun I. Eating patterns and mental health problems in early adolescence—A cross-sectional study of 12-13-year-old Norwegian school children. Public Health Nutr 2014;17:2554-62. Cutler GJ, Flood A, Hannan P, Neumark-Sztainer D. Major patterns of dietary intake in adolescents and their stability over time. J Nutr 2009;139:323-8. Rao SS, Asha MR, Ramesh BN, Rao KJ. Understanding nutrition, depression and mental illnesses. Indian J Psychiatry 2008;50:77-82. Holford P. Depression: The nutrition connection. Prim Care Ment Health 2003;1:9-16. Smith KA, Fairburn CG, Cowen PJ. Relapse of depression after rapid depletion of tryptophan. Lancet 1997;349:915-9. Sabelli HC, Fawcett J, Gustovsky F, Javaid JI, Wynn P, Edwards J, et al. Clinical studies on the phenylethylamine hypothesis of affective disorder: Urine and blood phenylacetic acid and phenylalanine dietary supplements. J Clin Psychiatry 1986;2:66-70. Mouret J, Lemoine P, Minuit MP, Robelin N. L-tyrosine cures, immediate andlong term, dopamine dependent depressions. Clinical and polygraphic studies. C R Acad Sci III 1988;306:93-8. Cass H. SAMe: The master tuner supplement for the 21st century, 2001. Available from: www.naturallyhigh.co.uk. [Last accessed on 2018 Aug 28]. Kagan BL, Sultzer DL, Rosenlicht N, Gerner RH. Oral S-adenosylmethionine in depression: A randomized, double-blind, placebo-controlled trial. Am J Psychiatry 1990;147:591-5. Janicak PG, Lipinski J, Davis JM, Altman E, Sharma RP. Parenteral S-adenosyl-methionine (SAMe) in depression: Literature review and preliminary data. Psychopharmacol Bull 1989;25:238-42. Hakkarainen R, Partonen T, Haukka J, Virtamo J, Albanes D, Lönnqvist J. Food and nutrient intake in relation to mental wellbeing. Nutr J 2004;3:14. Nemets B, Stahl Z, Belmaker RH. Addition of omega-3 fatty acid to maintenance medication treatment for recurrent unipolar depressive disorder. Am J Psychiatry 2002;159:477-9. Noaghiul S, Hibbeln JR. Cross-national comparisons of seafood consumption and rates of bipolar disorders. Am J Psychiatry 2003;160:2222-7. Puri BK, Counsell SJ, Richardson AJ, Horrobin DF. Eicosapentaenoic acid in treatment-resistant depression. Archives of General Psychiatry 2002;59:91-2. Tanskanen A, Hibbeln JR, Hintikka J, Haatainen K, Honkalampi K, Viinamaki H. Fish consumption, depression, and suicidality in a general population. Arch Gen Psychiatry 2001;58:512-3. Mischoulon D, Raab MF. The role of folate in depression and dementia. The J Clinical Psychiatry 2007;68:28-33. Sinclair AJ, Begg D, Mathai M, Weisinger RS. Omega 3 fatty acids and the brain: Review of studies in depression. Asia Pac J Clin Nutr 2007;16(Suppl 1):391-7. Fava M, Borus JS, Alpert JE, Nierenberg AA, Rosenbaum JF, Bottiglieri T. Folate, vitamin B12 and homocysteine in major depressive disorder. Am J Psychiatry 1997;154:426-8. Bottiglieri T. Homocysteine and folate metabolism in depression. Prog Neuropsycho Pharmacol Biol Psychiatry 2005;29:1103-12. Bjelland I, Tell G, Vollset S, Refsum H, Ueland P. Folate, vitamin B-12, homocysteine, and the MTHFR 677C -> T polymorphism in anxiety and depression - The Hordaland homocysteine study. Arch Gen Psychiatry 2003;60:618-26. Mischoulon D, Fava M. Role of S-adenosyl- L-methionine in the treatment of depression: A review of the evidence. Am J Clin Nutr 2002;76:1158S-61S. Bountziouka V, Polychronopoulos E, Zeimbekis A, Papavenetiou E, Ladoukaki E, Papairakleous N, et al. Long-term fish intake is associated with less severe depressive symptoms among elderly men and women: The MEDIS (MEDiterranean ISlands Elderly) epidemiological study. J Aging Health 2009;21:864-80. Bourre JM. Effect of nutrients (in food) on the structure and function of the nervous system: Update on dietary requirements for brain, Part 1: Micronutrients. J Nutr Health Aging 2006;10:377-85. Levenson CW. Zinc, the new antidepressant? Nutr Rev 2006;6:39-42. Merikangas KR, He JP, Brody D, Fisher PW, Bourdon K, Koretz DS. Prevalence and treatment of mental disorders among US children in the 2001-2004 NHANES. Pediatrics 2010;125:75-81. Nowak G, Szewczyk A. Zinc and depression, An update. Pharmacol Rep 2005;57:713-8. Nowak G, Siwek M, Dudek D, Ziêba A, Pilc A. Effect of zinc supplementation on antidepressant therapy in unipolar depression: A preliminary placebo-controlled study. Pol J Pharmacol 2003;55:1143-7. Verdon F, Burnand B, Stubi CLF, Bonard C, Graff M, Michaud A, et al. Iron supplementation for unexplained fatigue in non-anaemic women: Double blind randomised placebo controlled trial. Br Med J 2003;326:1124-6. Lomagno KA, Hu FF, Riddell LJ, Booth AO, Szymlek-Gay EA, Nowson CA, et al. Increasing iron and zinc in premenopausal women and its effects on mood and cognition: A systematic review. Nutrients 2014;6:5117-41. Feelders RA, Vreugdenhil G, Eggermont AM, Kuiper-Kramer PA, van Eijk HG, Swaak AJ. Regulation of iron metabolism in the acute-phase response: Interferon gamma and tumour necrosis factor alpha induce hypoferraemia, ferritin production and a decrease in circulating transferrin receptors in cancer patients. Eur J Clin Invest 1998;28:520-7. Abayomi J, Hacket A. Assessment of malnutrition in mental health clients: Nurses judgement vs nutrition risk tool. J Adv Nurs 2004;45:430-7.